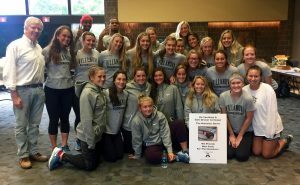 For the 2016 St Thomas of Villanova Day of Service the university’s women’s field hockey team helped The Joy of Sox® with a special project (pictures below). The Joy of Sox is a nonprofit with the simple mission of providing joy to the homeless by giving them socks. They receive a lot of their donations of new socks from sock drives conducted at schools and companies. 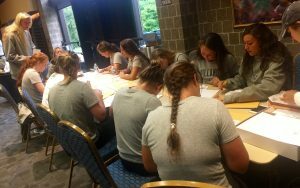 On Saturday September 24, 2016 members of Villanova University’s women’s field hockey team spent the morning signing letters and writing personalized notes to 174 Philadelphia area schools. The letters and notes, along with several handouts about The Joy of Sox will be mailed to the schools suggesting that the they consider holding a sock drive as a school community service project. 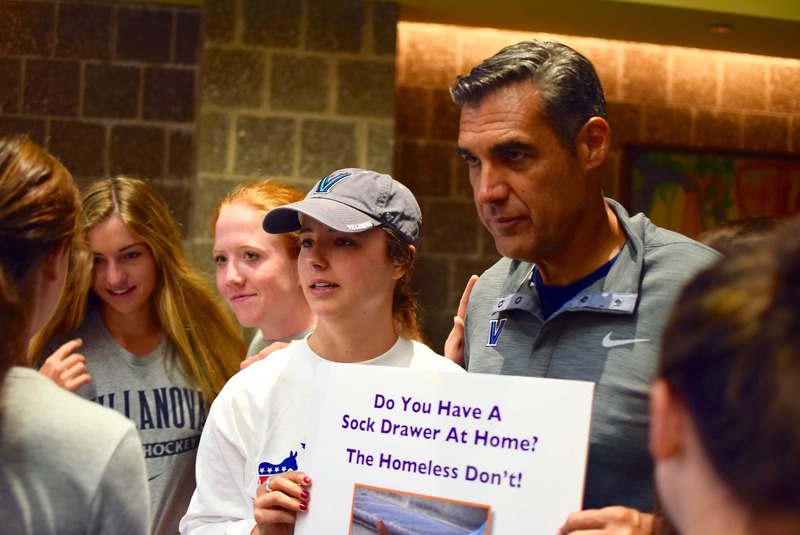 In 2015, a similar project by Villanova students, resulted in about 25,000 pairs of new socks being donated and distributed to the homeless. This year the goal is 30,000+. 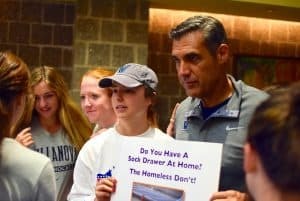 Since the homeless rarely receive donations of new socks the outcome of this effort can have a tremendous positive impact on the daily lives of the homeless. This model can be duplicated in other cities across the country. 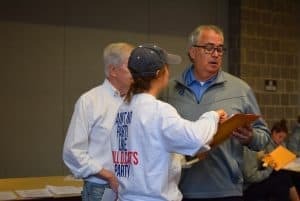 If anyone is interested in starting a similar campaign in their area please check out The Joy of Sox’s website, and in particular the page about conducting a sock drive. 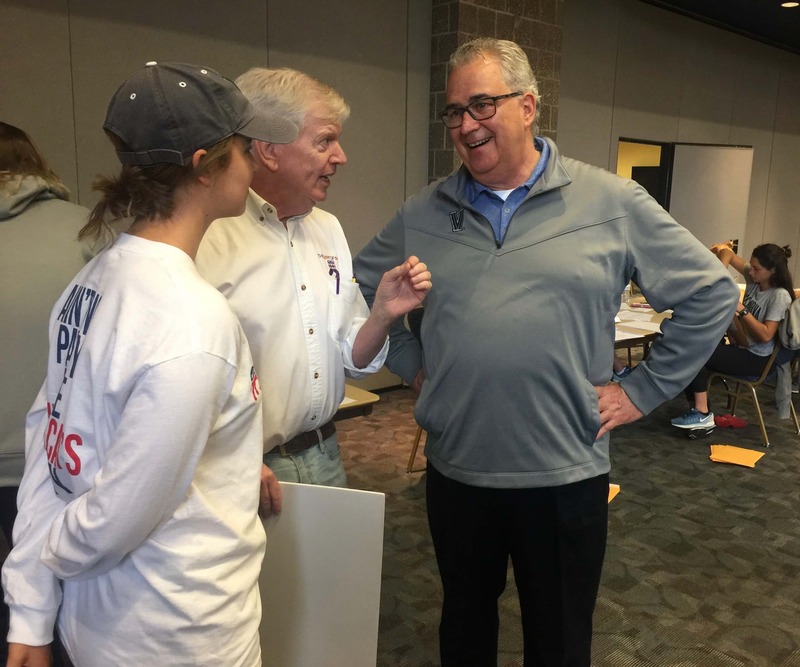 And also contact Tom Costello Jr, Chief Sock Person, by email or by calling 610-688-33318 (eastern time zone). Some of Villanova University’s women’s field hockey team, Basketball coach Jay Wright, and The Joy of Sox’s Chief Sock Person Tom Costello Jr.
St Thomas of Villanova Day of Service logo for 2016. 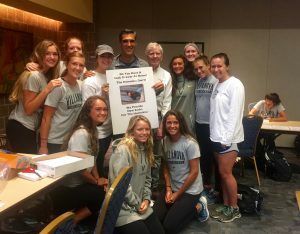 Eliza Clark and Villanova basketball coach Jay Wright holding a poster about The Joy of Sox. 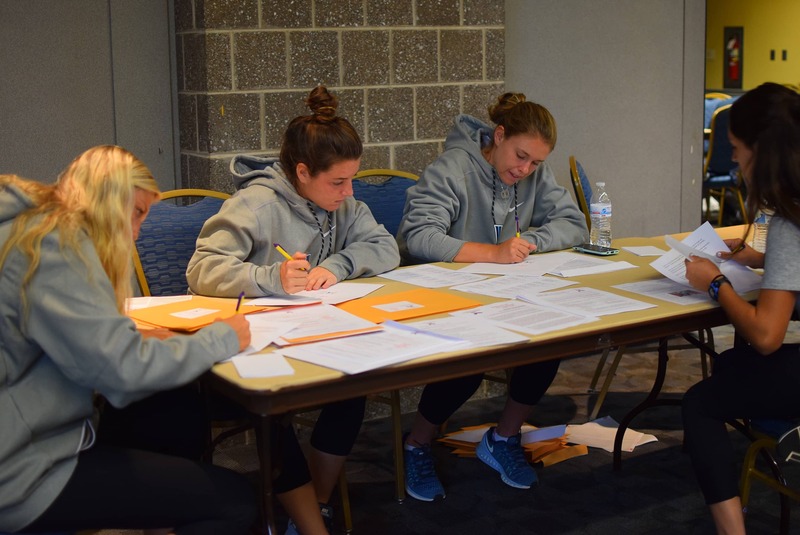 Some of Villanova University’s women’s field hockey team writng letters to Philadlephia area schools suggesting a sock drive for the homeless as a school community service project. 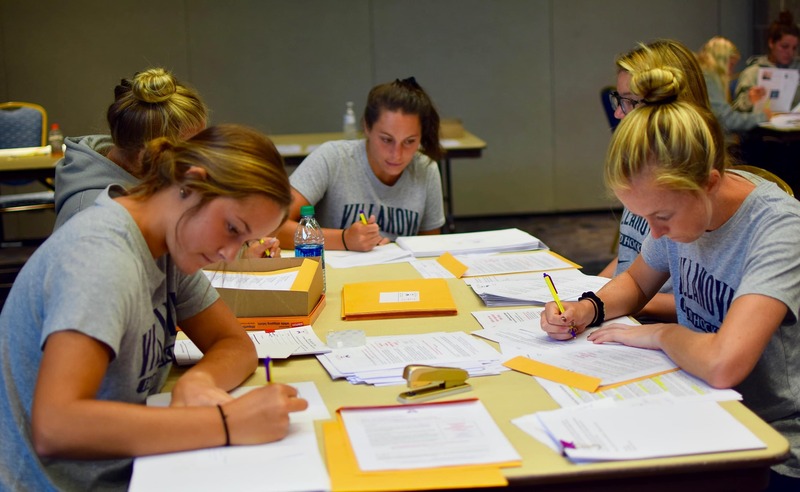 Some more of Villanova University’s women’s field hockey team writng letters to Philadlephia area schools suggesting a sock drive for the homeless as a school community service project. Still more of Villanova University’s women’s field hockey team writng letters to Philadlephia area schools suggesting a sock drive for the homeless as a school community service project. 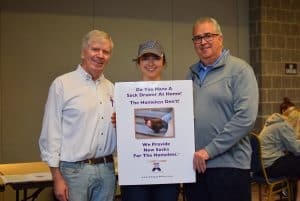 Eliza Clark, Chief Sock Intern, and Tom Costello Jr, Chief Sock Person, The Joy of Sox, explaining why the homeless need new socks to Fr. 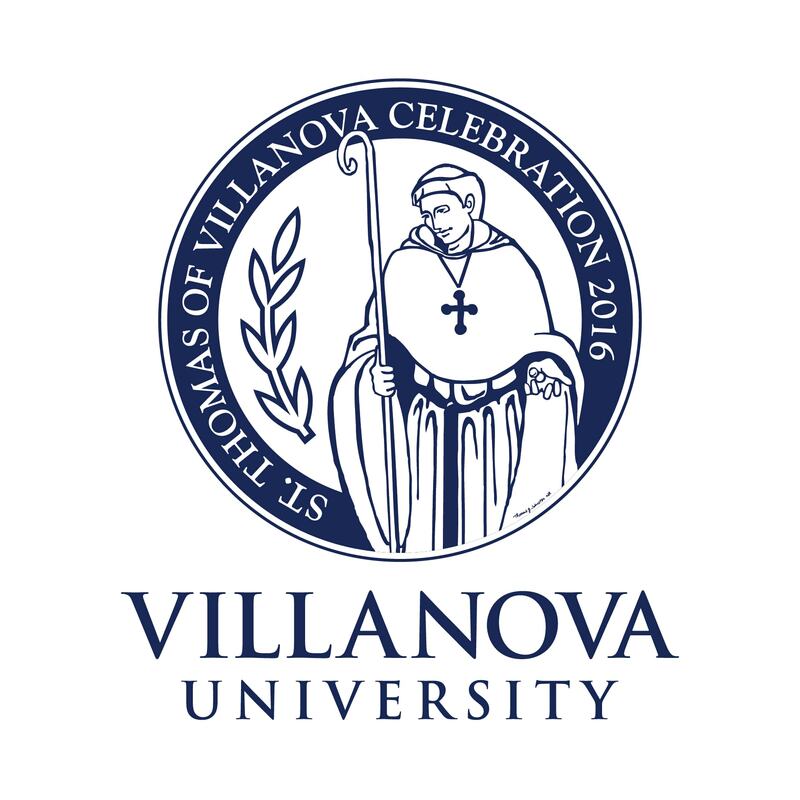 Peter Donohue, President, Villanova University. Eliza Clark, Chief Sock Intern for The Joy of Sox, explaining to Fr. Peter Donohue, President of Villanova University, that students hand write a personal note and attach it to each of the letters that are sent out to area schools suggesting they hold a sock drive as a school community service project. Tom Costello Jr, Chief Sock Person, The Joy of Sox; Eliza Clark, Chief Sock Intern; and Fr Peter Donohue, President Villanova University holding a poster about The Joy of Sox, a nonprofit that provides joy to the homeless by giving them new socks. At the end of the St Thomas of Villanova Day of Service, Tom Costello Jr, Chief Sock Person, The Joy of Sox, is very grateful for the continuing help that Villanova University provides. 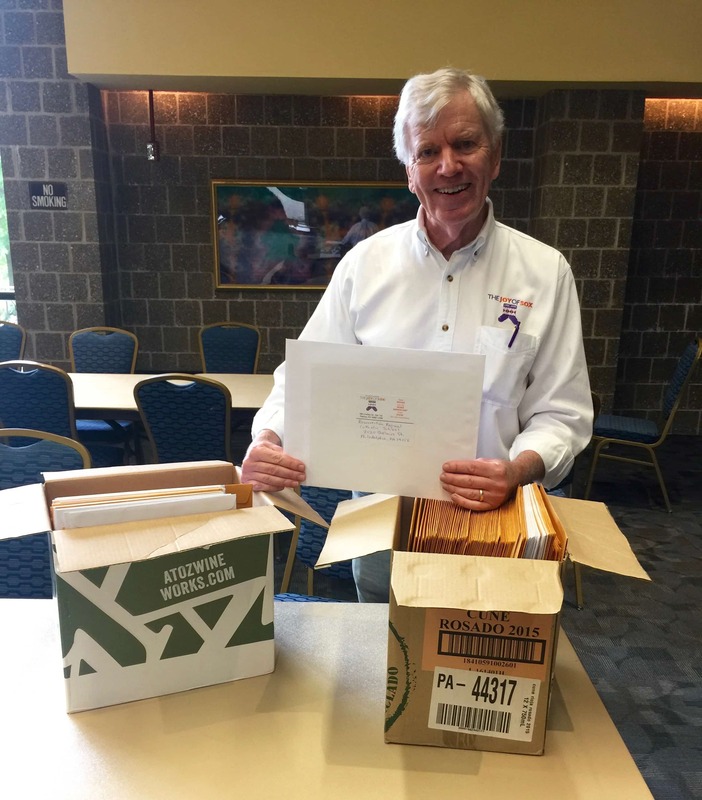 Here Tom shows one of the 174 “packages” that were put together by the university’s women’s field hockey team. Each package contains a letter signed by a student, along with a personalized handwritten note, and some handouts. 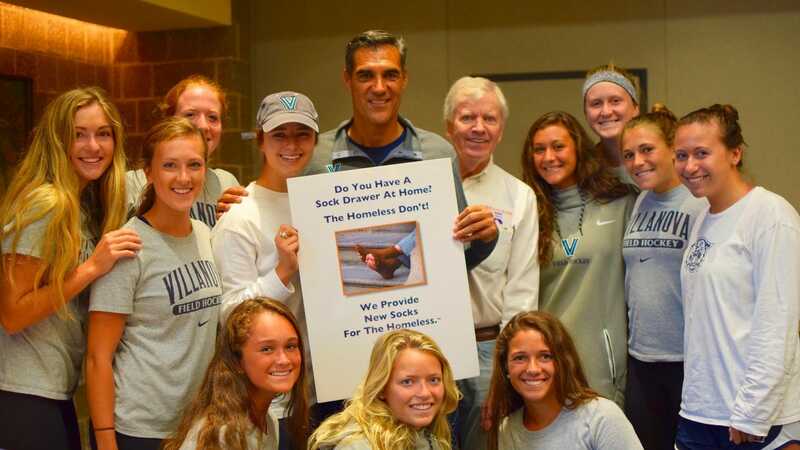 The purpose of the mailout is to encourage Philadlephia area schoool to hold a sock drive for the homelss as a school community service project.